Every team has a mix of introverts and extroverts, and every leader needs to know how to lead each type of personality. Here are some of the key differences that you should know about these two types of people. 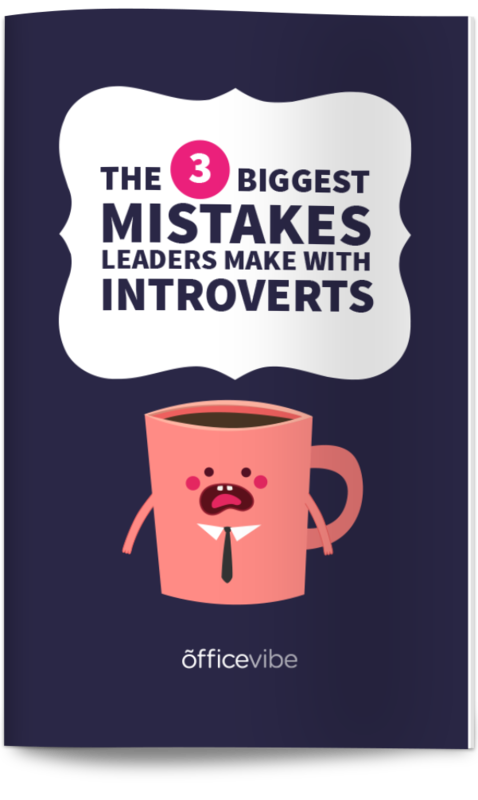 Download this helpful tip: The 3 biggest mistakes leaders make with introverts and what you can do to avoid them. <a href=”https://www.officevibe.com/blog/differences-introverts-extroverts”><img src=”https://assets.officevibe.com/infographics/infographic-introverts-vs-extroverts.png” alt=”The Key Differences Between Introverts And Extroverts” width=”600px” border=”0″ data-no-lazy=”1″ /></a>This infographic was crafted with love by Officevibe, the software that helps you <a href=”https://www.officevibe.com/employee-engagement-solution/leadership”>become a better leader</a> through frequent and honest employee feedback. Introverts tend to prefer to recharge by being alone. After a big social event (or team building event), they might need some time to be alone and gather their thoughts before the next round. Extroverts tend to like social events and recharge by interacting with people and socializing. I could easily see a situation where extroverted team members are socializing more with each other and introverted employees feel left out. This can create a scary dynamic on your team where cliques form, so it’s your job as a leader to make sure this doesn’t happen. As a leader, it’s important to be mindful of this. Give introverts the space they need, make some team building events optional, and make sure everyone is comfortable at those events. Introverts like one-on-one, deep conversations, whereas extroverts seem to like group conversations. Again, I could easily see a situation where extroverts command a lot of the attention and introverts end up feeling left out. As a simple example, imagine if for team building, a leader says that everyone should eat lunch together. In a large group of 10 or more people, I could easily see introverts quieting up or only chatting with one or two people at the lunch table, and it might come across as them being disengaged or not “into it”. As a leader, something simple you could do is more activities where you pair people in groups of one or two to work on a project. That makes it easier for introverts to connect with many people on the team. Introverts like forming deeper relationships. They like really getting to know someone, their hobbies, interests, etc. As a leader, this is a great opportunity to get to know your employees better and build those closer relationships with introverts. What you’ll want to do, is spend a lot of one-on-one time with some of the introverts on your team. You can ask them about things going on in their personal life as well, because they’ll likely want to share. They like forming those bonds. Extroverts on the other hand, like being friends with many people but don’t form as deep of a relationship. That’s okay. More than anything, it’s just important for you to know this as a leader. Introverts listen more than they speak. They’re really deep thinkers. As a leader, you need to understand that it’s okay if they’re not the loudest ones in the room. If you’re in a meeting with your team and you notice that some of the introverted employees are a bit quiet, don’t think that they’re not paying attention or that they’re not engaged. They probably have great ideas, but just need a bit of time to process. They’ll be back with relevant insights from whatever meeting they were just in, but give them the time and space they need. Extroverts might be the loudest ones in the room, but that doesn’t mean that their ideas should be taken by default. Introverts are very comfortable with their habits and their routines. Business changes every day, and leaders need to do a better job at helping their employees (introverts and extroverts) manage change. Introverts might be a little more resistant to change. This is important for leaders to recognize when announcing a new program or any new change. You might have to spend more time explaining the change or maybe announce it earlier. Just be mindful of the fact that introverts might be a little more resistant to the change, so keep that in mind when change is coming. Introverts are deep thinkers, meaning they need to focus on what they’re doing to produce good results. They like to put their headphones on and get in the zone. They also get distracted easily, which is important for leaders to understand. With open office designs, it’s becoming harder than ever for introverts to get the kind of deep concentration that they need to do good work. One big mistake that people make with introverts is that they’re shy. It’s not that they’re shy, it’s that they’re thinkers. There’s a huge difference. In fact, when an introvert trusts you and is willing to form a deeper relationship with you, they’ll share more than you might expect. Extroverts might seem more open, but they more often than not remain on the surface level. Introverts form closer connections, so you just need to make them feel comfortable opening up and they will. Introverts open up to a few people, but when they do, they really open up. It’s important to understand that it’s not that they’re not willing to open up, it’s that they’re very selective about who they’re willing to open up to. Leaders need to work hard to make introverts feel comfortable. It’s hard work, but it’s totally worth it. Make introverted employees feel like you’re a friend and care about their best interests. Extroverts are ready to open up, so you won’t have much work to do with getting them comfortable. Introverts need time to reflect before making a decision. They need time to think and weigh their options. It’s important that you learn how to structure decision-making at your company to handle this. If there’s a brainstorming decision where something needs to be decided within the next 10 minutes, you won’t get good ideas from anyone. Introverts will likely just stay quiet or try and chime in and regret what they said right after. A smart idea is to give enough advanced warning on almost anything you do to make sure everyone has time to prepare. If there is a brainstorming meeting, then give people time to prepare in advance and let people come and present their ideas at the meeting instead of doing it so quickly. Extroverts need attention. They thrive on it. As a leader, it becomes increasingly hard to make sure extroverts get the attention they need while making sure introverts have a voice. There are some ways to accomplish this, but it does take a lot of work from managers. Good managers will find a way to balance both though, and ensure that everyone on the team has a voice. I think it’s that introverts are just deeper thinkers and can get distracted easier. Extroverts might be better at tuning out the background noise, but either way, quiet time is so important for productivity. At our office, we have dedicated spaces where people can go to work in peace, and almost everyone wears their headphones constantly. I think taking it a step further would be to enforce a quiet day (we used to do this, but for some reason stopped), so that everyone can at least have one day of uninterrupted work. It takes so much time to get back to work once you’ve been interrupted, and now interruptions are more frequent than ever. This is a tough one, because introverts might need to be prompted to submit ideas in a group setting, but it’s not good to put people on the spot. This takes a lot of balance and a high emotional intelligence for a leader to get this right. In meetings, what you’ll want to look for is an introvert who looks like they probably have something to say, but are patiently waiting. There are signs that you can see that might let you know that the introvert would at least have something to add if called on. Either way, more than anything, it’s good for leaders to be mindful of the differences between the two. How Do You Handle These Two Personality Types? Let us know how you deal with introverts and extroverts below!